The Little Brother to the Little Guy Max Hits Showrooms This Spring. FOR IMMEDIATE RELEASE: Uniontown, Ohio, March 21, 2018 – Liberty Outdoors is proud to announce a new addition to the Little Guy family. The Little Guy Max is getting a little brother, named the Little Guy Mini Max. The Mini Max is smaller than the Max by design, but it retains many of the same great features of the Max. The Little Guy Mini Max weighs just under 2,000 lbs. and is towable with a small/mid-size SUV or a well-equipped crossover. Manufactured by Liberty Outdoors in Somerset, Pennsylvania, the Mini Max features the same high quality materials, superior craftsmanship, and thoughtful details as it’s bigger brother. The Mini Max weighs just under 2,000 lbs., making it an ideal companion for most small SUVs, and well-equipped crossovers. It’s also very roomy for it’s small stature. The 6 ft. interior height gets the most out of every inch, and the amount of storage is simply larger than anything in it’s class. The interior of the Mini Max is full of innovation. 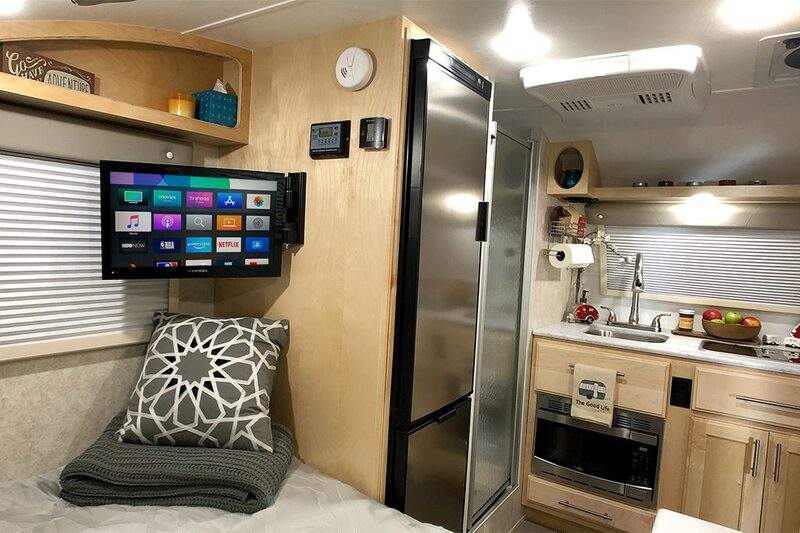 Several design touches allow a residential style wetbath, a microwave (not seen at this size), a queen or dual twin bed configuration, and an unbelievably large refrigerator which is actually larger than the Max. The Little Guy Mini Max has a surprisingly spacious interior, with many of the same great features as the larger Max. “We are super excited to announce the Mini Max. Our community has spoken and we are responding with a smaller Max that is much easier to tow, while not sacrificing the best features or the craftsmanship of the larger model. Our operations team and production crew has outdone themselves with the Mini Max. We can’t wait to bring it to the teardrop market,” said Liberty Outdoors Co-founder and Managing Director of Sales and Marketing, Joe Kicos. The Little Guy Mini Max is entering production now. See golittleguy.com/mini for more features, specs, and a 3D tour. Dealer opportunities are available now. Call 1-877-545-4897 for more details. Established in 2017, Liberty Outdoors’ mission is to deliver high-end recreational products with superior features and design for outdoor enthusiasts worldwide. 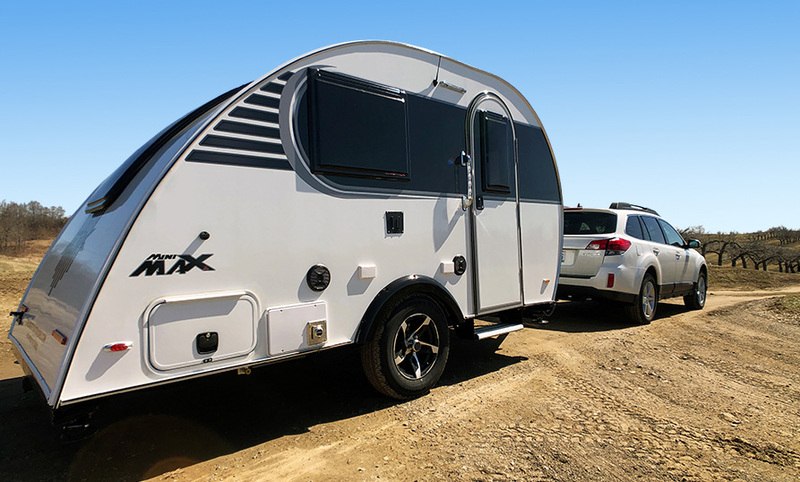 Headquartered in Uniontown, Ohio, Liberty Outdoors was formed as the result of a merger between Little Guy Worldwide and GFM Manufacturing, and is the parent company for Little Guy light-weight teardrop trailers, ParkLiner full fiberglass trailers and Serro Scotty retro campers. Liberty Outdoors has more than 80 employees, with manufacturing sites located in Pennsylvania and North Carolina. Dr. Godfrey F. Mendes is a Co-Founder and the Managing Director of Operations and Joe Kicos is a Co-Founder and the Managing Director of Sales & Marketing for Liberty Outdoors. Download high resolution logos and photos of all Liberty Outdoors products at the link below.